When you're out on the water, here are the key things to do to stay in touch and call for help if you need it. If you are planning a boating trip, there are a number of safety measures you should take. These include, but are not limited to, informing a trusted person on shore where you are going and when you intend to return, and at what point they should raise the alarm should you fail to return. Coastguard and Water Safety New Zealand developed a downloadable 2-minute form that will help you note down the key information about your trip, your boat and the people on it. It could prove invaluable in the event of an emergency. Please remember to close your TR when you have arrived at your destination. Failing to close a TR will NOT initiate a search. If you require assistance you must be able to call for help. It is also a good idea to ensure a trusted person can raise an alarm from ashore if you fail to return as planned. In the event of an emergency, a TR will help rescue authorities know where to start looking and how many people are aboard. Coastguard's call sign database includes details of your emergency contact, the type, size and colour of your boat, what equipment you have aboard and other such details. It’s important you update your call sign details if you sell your boat or if any of your details change. Calling for help can be done by VHF, Cellphone, EPIRB, torch, whistle, distress flares and other means. Please see our In An Emergency page for details of how to make a Mayday call. Taking your cellphone with you on the boat is a good idea, but be sure to keep it in a water proof bag. Remember there is no guarantee that you will be within cellphone range, so having two forms of communication is vital. On a boat your second form of communication will usually be a VHF radio. The VHF channel to use for marine distress is channel 16. A VHF Operator Certificate is required to operate a VHF in anything other than an emergency. EPIRBs must be registered with RCCNZ. A boating course such as Day Skipper, Boatmaster or Sea Survival will teach you what to do in an emergency, and how to call for help. A VHF Course will teach you how to operate a VHF radio correctly, how to radio for assistance, and what to do should you hear a distress call from another boat. 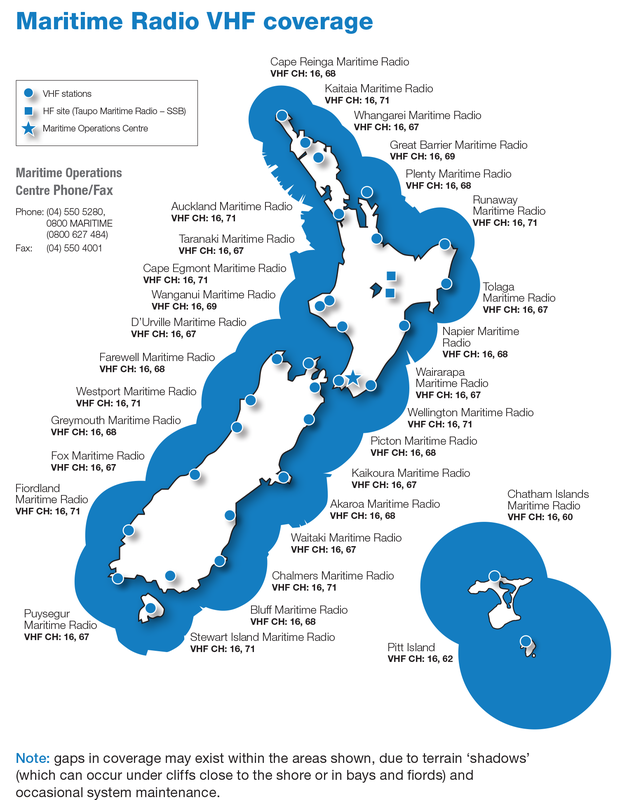 On 1 October 2016 New Zealand, along with a number of other countries, changed a number of maritime VHF repeater channels. These changes were made to make space for newly allocated services for international ship tracking and data services which will ensure New Zealand VHF radio services are compatible with the rest of the world. The changes affect Coastguard VHF and NowCasting channels. It's important to note that although some maritime channels will be changing, the existing marine Channel 16 used for safety and distress purposes has NOT changed. No one should need to buy a new VHF Radio to access the new VHF or NowCasting channels. All current VHF radios will be able to access the new channels. For more information please visit Radio Spectrum Management.